After 12 years at the Rio Grande Foundation and another 8 doing public policy in Washington, DC, I feel like I have a pretty good understanding of a lot of different public policy issues. But I ran across an article from Nate Silver’s website FiveThirtyEight which dealt with the amount of time spent in school by children in the various economically-developed nations. You can see that chart below. 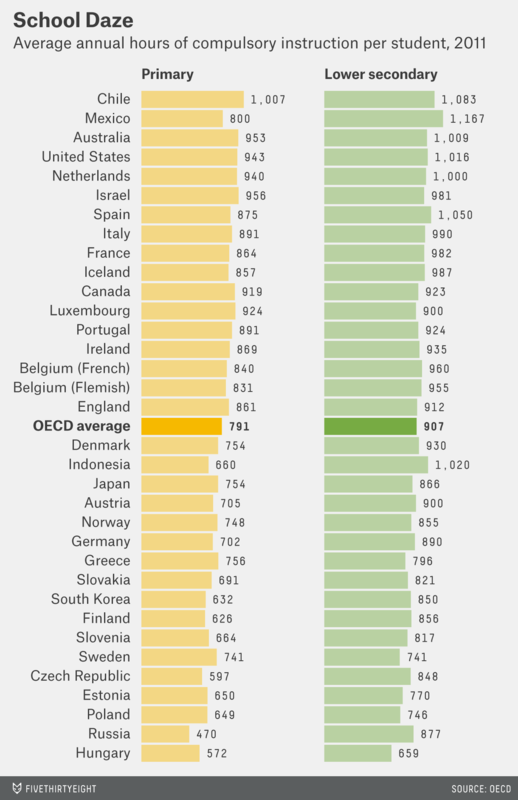 I’d always assumed that high-performing nations like Japan, Finland, Korea, and New Zealand (click on the PISA scores here) kept students in school for much longer than American students. Boy, was I wrong. As it turns out, American primary students in primary school spend more time in school than any OECD nation besides Chile, Israel, and Australia. Similar results can be found when “lower secondary” years are added in. What’s this mean? Well, the big push from Michelle Lujan-Grisham and the Democrats (and Gov. Martinez) has been for younger and younger schooling in terms of universal pre-K. Yet, it is hard to see that American students derive much benefit from all the extra time they are already spending in school (at great expense to taxpayers). The push for pre-K simply does not hold up under scrutiny. Charter schools are a good start. Given New Mexico’s serious education challenges our view has consistently been that New Mexico needs “radical” school choice. That could mean private, public, charters, virtual, blended, home-school and other options.